Includes Up To 5 Accessories such as Veil, Garter, Etc. Untreated, invisible stains such as sweat, dirt, and oils from your wedding day can wreak havoc on the delicate fabrics of your wedding dress and cause staining, yellowing, and even fabric decay over time. This is why more brides choose our service when it comes to trusting their wedding dress to a world class wedding gown cleaning and preservation service. Since 1913 our service has helped over 3 million brides take their beautiful wedding gowns from the back of the closet and into family heirloom status. This award winning delicate fabric cleaning technology and patented preservation process is world class and trusted by not only discerning brides, but also by museum curators who demand perfection. We've crafted a selection of customized wedding gown preservation kits perfect for your dress and your budget. Perfect For: Wedding dresses that are less than 20 years old and originally purchased for less than $500. Perfect For: Couture wedding gowns less than 20 years old with an original purchase price of more than $500. 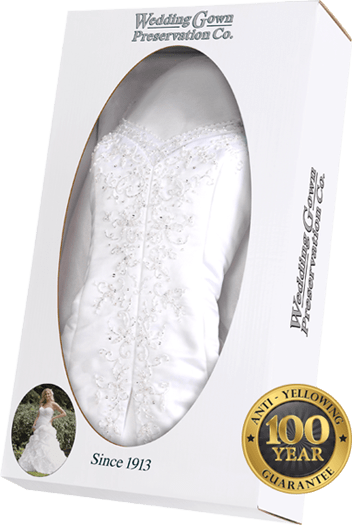 Perfect For: Wedding gowns that were originally purchased over 20 years ago or gowns less than 20 years old that are badly yellowed or stained. Perfect For: Wedding gowns that will be soon worn again or wedding dresses that will be sold to another bride to be worn again. What Are Our Brides Saying? Over 3,000,000 Happy Brides and Counting. I am extremely thrilled with the way my dress and other keepsakes are presented in the box! They are all beautiful and it is something I will now be able to treasure for a very long time. I was so relieved when the dress arrived earlier than expected, and it looked just as beautiful as I remembered! Thank you so much for the beautiful job you did on preserving my bridal gown. I was hesitant to send my gown in the mail because it is very precious to me, but the process was easy and I was kept updated. I have already recommended you to other brides, convincing them that selling isn't the only option. The affordable service is preservation of a memory! Thanks again! The Wedding Gown Preservation Co. was the best choice I made for my dress. I needed an affordable, safe way to have it preserved and they made it happen. My dress showed up in a timely fashion without the need for follow-up and the presentation of my gown is beautiful. I think the cost was very reasonable as well. They communicated with me every step of the way so I never worried about it getting lost. When it arrived, everything was perfect and the dress looks like it did on my wedding day. Thank you! When I received my dress, the box was not damaged & my dress looked so perfect. I would definitely recommend this to any girl who would like to keep her memories as perfect as can be. Thank you so much for taking care of my dress! My experience has been a wonderful one. The customer service was excellent. I have already referred another blushing bride to your website. I have to admit I was a little skeptical about sending my expensive wedding gown off in the mail but the service, control and end result have been superb! It was efficient and came back even better than I expected. The kit arrived quickly with its detailed (but so easy) instructions and the customer service was so nice in easing me with my concerns since my gown is all fragile lace and beads. Still Not Sure if You Should Clean & Preserve? Your wedding gown represents one of the most amazing days of your life. Exciting memories of shopping for your perfect dress, getting ready for your big day surrounded by close friends, and of course, the moment you first stepped out onto the aisle to begin your new journey with the most special person in your life - All these memories are locked away in your wedding dress. Unfortunately, this momentous day can also leave unwanted memories trapped in your gown. 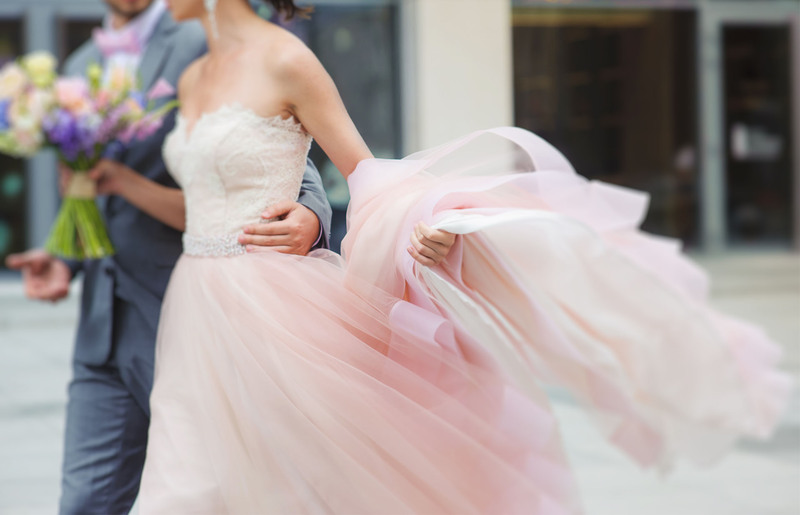 Untreated, invisible stains such as sweat, dirt, and oils from your wedding day can wreak havoc on the delicate fabrics of your wedding dress and cause staining, yellowing, and even fabric decay over time. This is why over 3,000,000 brides have chosen to trust our award winning service when it comes to trusting their wedding dress to a world class wedding gown cleaning and preservation service. We're sure you do. We've taken the time to create a learning library to help you discover why our service is considered the most trustworthy wedding gown cleaning and preservation in the nation.